Here’s my second Issy top! The first one is already in the wash as I made it in black so I could wear it to work. I made the black one in a double knit and while it isn’t nearly as drapey as this rayon knit one, I have to say it doesn’t look half bad. Pictures of the black one later. Let’s get on with this abstract floral one. It’s so perfect for Spring! I had the fabric in my stash for what…I don’t know. Thank you fabric stash! I actually bought the Ziggi jacket pattern from Style Arc and this top pattern came as a bonus. I still haven’t muslined my Ziggi. The thing to know with Style Arc, in case you didn’t know already, is that you get one size. No nested sizes for you to work with. So, choose carefully. I went for the size 10 and on both of my versions I had to take them in at the waist. I’m getting extra drape around the bust…but it’s my bust so I want to make sure there’s room for a drape so I left as is. The patterns came from Australia so there was about a two week wait but you know… you get busy, download a couple of patterns in the meantime, cut a couple of tops, muslin a dress and your patterns arrive in no time! I always like to show a back view because the back tends to pool on tops. Taking in the sides helped with the pooling…though, honestly, you can’t tell because of the print. So maybe that’s the take away from this project- go for a print when first testing a pattern. That way any mistakes are invisible. 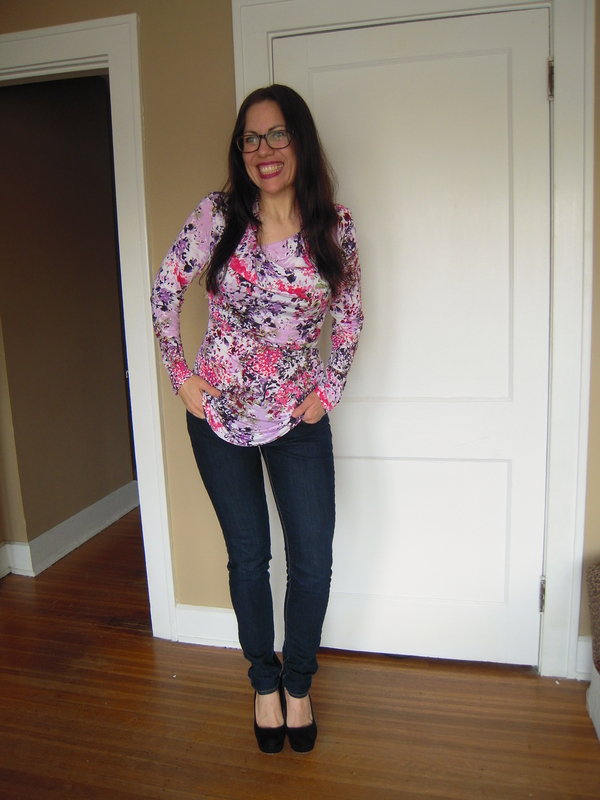 I couldn’t decide if I liked the black platform shoes or my hot pink ones…and glasses or no glasses…so I played around. This picture below, left, is really just an “omg, I love my new haircut” picture. It really serves no other purpose. The front drape on this top is just so cool. And the asymmetrical hem is really cool, too. The front drape is really easy to put together but you really have to just do it. Baste it first if you’re nervous…and then send me a tweet. That’s what I did with Divinerae and she was like, yeah, you’re fine…and like magic, I could finish my first version. This second version took a lot less time. Even with tweeting and watching Buffy, it was done in 2 hours. What do you think about the shoe options? Black or pink? Also, have you tried any Style Arc patterns? How many of these tops do you think one can have in a closet? I’m thinking a couple of solid versions and I have a stripe knit that would look really cool with the side gathers and the front drape- playing with the stripe. Thank you! I do love those black shoes…I hear ya. I like both shoes but I think the pink are competing for attention with the top. I definitely see the top more with the black shoes. 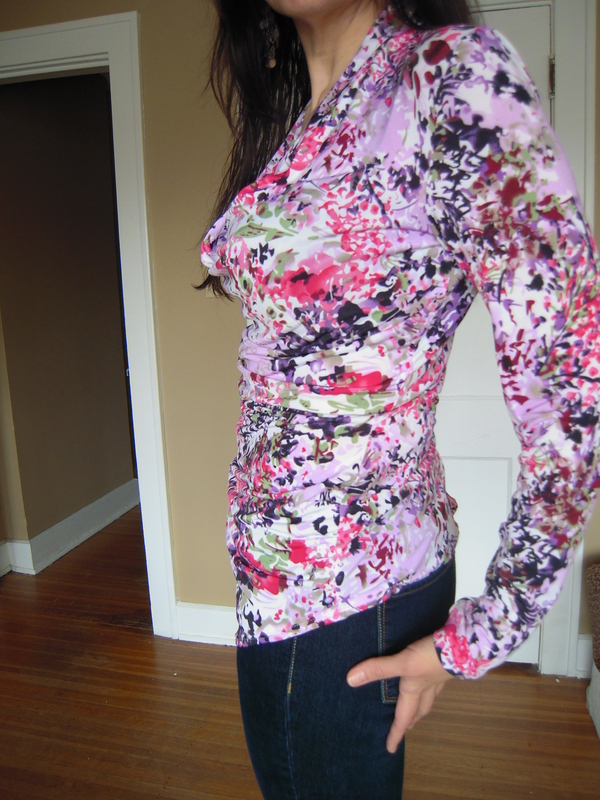 Love the print on you – great top! I love the pink shoes. 🙂 That’s a great top! I love the neck line. You make me want to make all the things! The bows on the pink shoes are my favorite part! I wish we were closer, you could come over and we could make tops all morning! i am curious to try style arc, one of these days! love this top. i keep seeing people make it, and it looks great every time! I hope you do try them out. I’ve been wanting to try them out for a while, too. It was nice to finally get one of their patterns and see how lovely it turned out. You blogged the Issy! 🙂 That top is gorgeous in that floral! I’m in the black shoes camp. Yeah! It helped to get you cheerleading me on twitter! 🙂 And thanks. I’m loving this new top!! Sharp style, you do need a bunch of these! I really do! And they’re a quick make, too. That’s always a plus. Leila you look amazing! That print is great on you. I’m partial to the black shoe, but the pink ones are cute. I do love Style Arc Patterns, they are the best! Sweet freebie pattern Leila, it’s really flattering. I say go make a bunch in different fabrics like you’ve got planned. This top is fabulous! 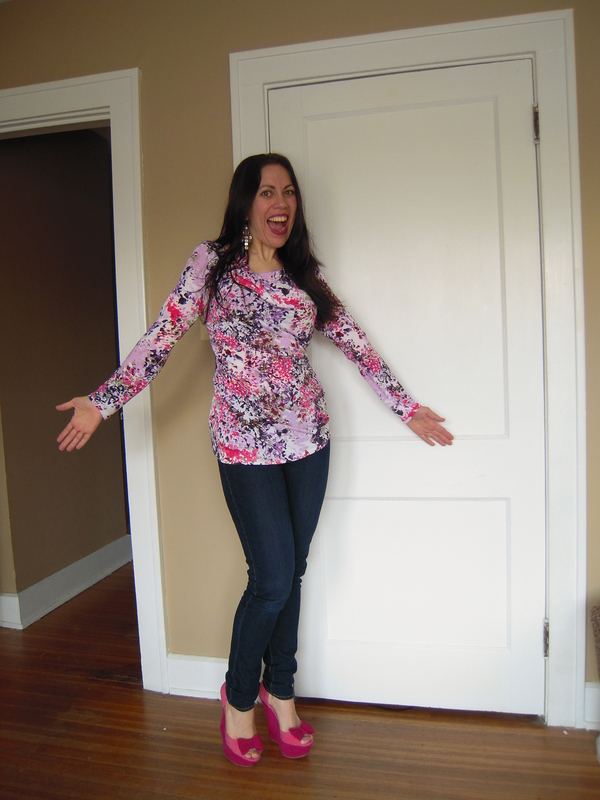 I love the print (partial to pink, anyway) and agree, the black shoes focus attention on the top. The whole look is great! It’s so cheery and springy! I vote for the pink shoes. I haven’t tried Style Arc yet. One of these days, hopefully. wit woo! looking fantastic lady! i love the print on your new top. and your hair looks great! CUTE! I’m not help with styling. I like both pair of shoes. 😀 And, you’re looking fantastic! PINK!!!!! And holy batman your legs look a million miles long with those heels! Love! Love your top! I just started work on my issy today and was glad I found your post! So helpful to see it made up and on a real person 😉 Yours is lovely! Thank you!! And I’m glad you commented. It reminds me of how much I love this top! Hope you enjoy yours as much!